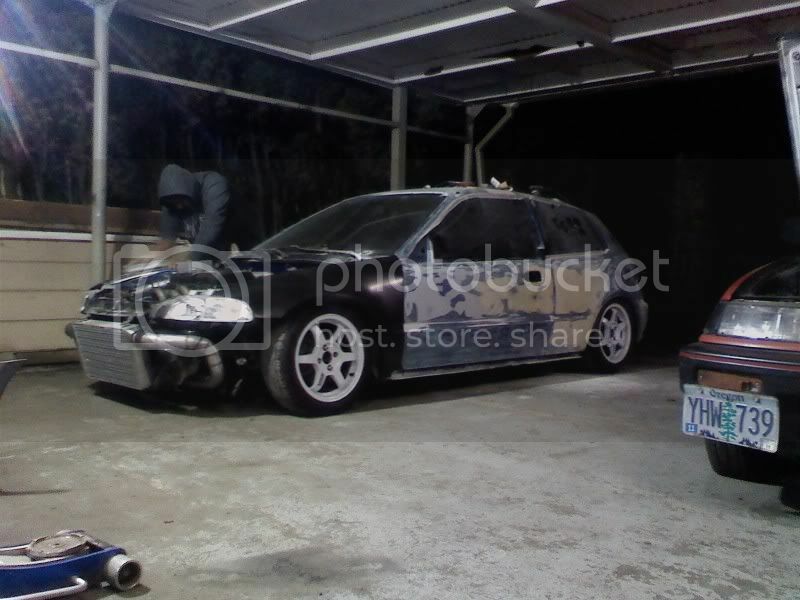 Honda-Tech - Honda Forum Discussion - Discussion Topic: Let's talk Intercoolers!! I had very little choice on mine due to size and location but I think it fits sweet right above the transmission. I'll add a scoop and maybe some protective sheet metal or fender liner to keep road debris from launching through it. It's not an over the top HP install so the size of the intercooler could be sacrificed...no idea what make or brand it is or where it's from. Greg fished around a great deal to find one that fit. I didn't want to pay for a custom one! I think it reminds me of an OEM Subaru layout, and some of the Skoda compact turbos in Europe. It definitely needs a good scoop to exchange air, but at least the plumbing is nice and short and the tanks look decent (from this angle, anyway). What type is it? Which company core? Now THIS is how you start out a thread ;) !! I just have a cheap jdm sport fmic, the fins aren't very dense but the core is pretty good size, Im probably going to modify it to be a back door setup once I get the car back from paint so my charge pipes will be alot more direct. Im interested in seeing how the end tanks as well as in and out entrances of the intercooler can impact air velocity and what not. also I live in oregon were about the hottest we see is 90 degrees for maybe one week a year other then that its around 65 degrees most of the time and cold as crap in the winter. Interesting. Now, I know your project "ebay runner---OMG YOU'RE DOING IT WRONG!!" (haha, that still kills me.. ;). But can you tell me if the JDM sport is a tube and fin and a bit close up of the fin design? I know they are in the "ebay" category of...well... frugality, but I'd like to see what they companies are trying to copy off of. I'm sure it works, I'd just like to see the visual efficiency of it. Lookin' good so far.. C'mon guys.. Step up to the plate!! to be honest I don't know the differences in the two designs and what they do for you but If I remember right this one was a "delta fin" the fin parts are pointy instead of flat on the face (excuse my cave man terminology) I can take more pictures of the core and stuff when I get the car back from paint to help show the difference between this cheap fmic and a nice garrett core. I mainly posted in here to gain a little more knowledge on the subject from you not to show off my $100 intercooler. you know way more about this stuff so Id like to pick your brain. 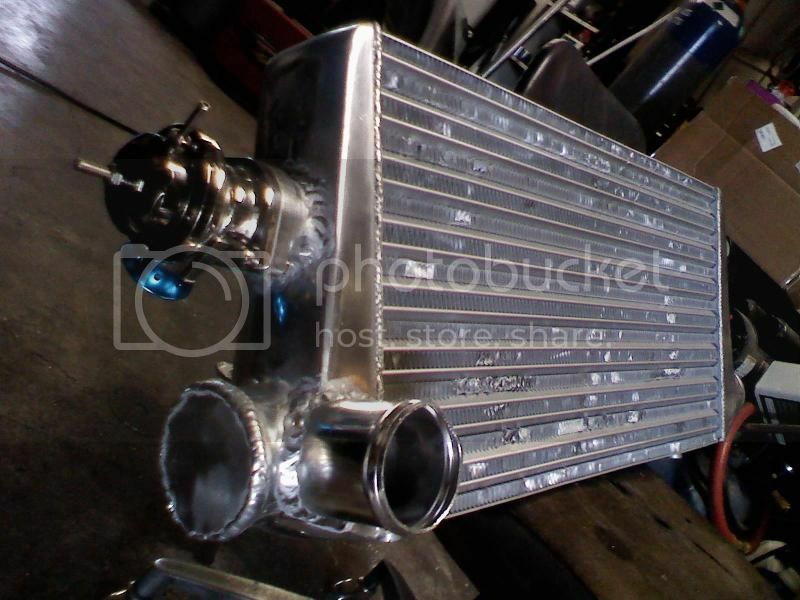 heres a back door intercooler I did for a friend. shodan how do you think the inlet would affect power? would it be noticeable on a street car vs how they are normally ran? I'm running a precision 600hp intercooler on my DC2. Generally my intake temps around town are 10 degrees above ambient and when boosting my intake temps are ambient temp. 19 lbs of boost on a 60mm turbo pump gas. Down in Texas car runs great. It's a 13 year old spearco from a fmax kit. That wouldn't help anything, as remember, the intercooler is a heat exchanger, and runs on moving, flowing air. If the car is sitting still, there's no heated air that "sits" in the exchanger; it completely dissipates. Now if you're thinking water sprayers that keep exchange air temps down while the car is moving, that's a different story. lol sorry bad joke pointed at the "water cooling after shut down" thread, but back on topic coming from the subaru world I would like to see some stats on if intercooler sprayers have much affect on IAT's to be worth the trouble. how much does the thickness matter as in is there a thickness that shows minimal gains once reached like 3 or 3.5"
also, can a thicker intercooler that has less surface area perform equally with a thinner one that is a little bigger? The efficiency and thickness depends heavily on the overall setup. Things like air flow, amount of air being compressed, and Intercooler design play a large part. So to vaguely answer your question; the thinner the better but the more the surface area the higher the pressure drop. Typically this is compensated for just turning up the boost. Say you have a 10"x10x5" Intercooler versus a 10"x10"x3" - the second will cool better until a certain CFM. This is why sizing is so important. Everything from turbo size, manifold length/runner, piping sizes, ect must be chosen for the specific setup. Too many people say "bigger is better" but don't realize their setup could be that much better with smaller parts. Planning is key to the perfect purpose built vehicle. Goals are extremely important. Without getting too technical think of it this way. Hold a finger in front of another finger and blow. Now add more fingers until the end one stops feeling air. This is the inherient problem thick core inter coolers and radiators. Typically larger fans are required to take full advantage of a larger core radiator. Now as far as core size, blow through a straw. Now add one, then one more, blowing through each of them. 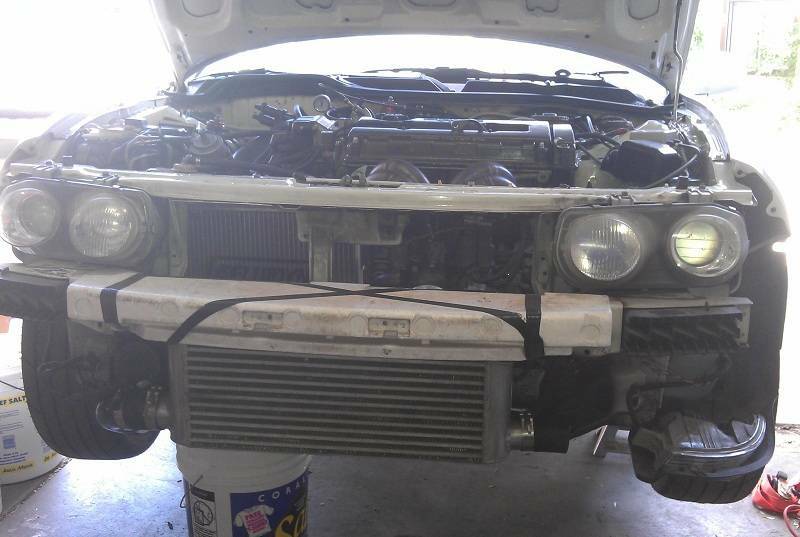 There is such thing as making an Intercooler too big. The goal is to achieve the best temperature drop with the least restriction both over and through the Intercooler. All intercoolers benefit from air daming and proper ducting. Most people just through them behind the radiator and,call it a day. Keep in mind, this is all for Air to Air as Air to Water is completely different with some same basic principles. I'm running a precision 600hp intercooler on my DC2. Also, how much does an intercoolers nominal hp rating actually matter? Are they typically overrated? Does using a block off plate (thing stock EG without AC - the factory block off plastic) have an effect on how air travels through an intercooler? A friend of mine built one for me a few years back and I never ended up trying it out. The idea was to help more air get to the radiator, but I was always curious if that had a negative effect on the intercooler. My last setup was a CXRacing intercooler, 81mm gsr GT35E - car made decent power 450 on 19psi, if I were to do it again I would probably look into something a bit more efficient such as the Precision. I went with a Treadstone TR8 intercooler for my Integra. I used it because it was a bar and plate design, 3.5" thick, flowed the amount I needed for my setup, and the dimensions fit nicely behind the bumper without hacking it all up. Even in the Florida heat during the summer it's always cool on the cold side, so she does her job well! I will most likely upgrade to the new TR8L which is wider and flows enough for 575hp when I upgrade my turbo soon. As you can tell it hides away nicely without any bumper trimming. Correct. One must also take into account of the type of intercooler that they're using. Bar& Plate vs. Tube/fin make a big difference in determining the area size needed to be efficient, especially when it comes to thickness. Typically, channelled fins in the bar and plate intercooler and tube/fin styles need more surface area overall (even if its only 3" thick) to exchange air more effectively than a louvered bar & plate. Garrett went from a two-row louvered fin Bar & plate design to a 3-row design, (alternating every other row) over the last two years. They kept the same thickness of 3"-3.5"..
From my experience using the lower plastics under the car always helps with air turbulence and keeps the air directd to where its needed most; forcing it into the intercooler and radiator.